Bed bugs can hide just about anywhere. They’re small and flat enough to fit anywhere a credit card can fit, which doesn’t leave out much. That means that almost any crack or crevice in your home could be a harborage area for bed bugs to hide in. Many of these areas are relatively easy to treat. Armed with a vacuum, steamer, clothes dryer, and the right sprays and powder, you can tackle most potential hiding places in a room. However, some things can’t be laundered or steamed. Many items, like books and shoes, can be treated in a portable heater, like a ZappBug or ThermalStrike. But what about the various electronics you own, like your TV or laptop? Bed bugs aren’t likely to hide in electronics. While it can happen, and does from time to time, you generally only see infested electronics in severe bed bug cases. Bed bugs are only attracted to heat when feeding, so they have no interest in hanging around warm spaces the rest of the time. The electronics most likely to harbor bed bugs are the ones closest to the bed, like alarm clocks and nightstand stereos. Regular treatment methods will likely affect bed bugs hiding in electronics, too. Regardless of where they’re hiding, bed bugs are going to want to feed some time. They typically don’t wait long between meals when they have access to their host, so they’re going to come out and try to feed. If you’re following our 4-step solution, and are using residual sprays and powders as part of your treatment, it’s likely that any bed bugs hiding in electronics will come in contact with the residuals and die. Some electronics can be treated with a heater, but it’s risky. This is due to the high temperatures that bed bug heaters reach in order to thoroughly kill bed bugs of all life stages. Using a portable heater to kill bed bugs is only guaranteed with at least 120 degrees temperature for at least 30 minutes, and many electronic components can be damaged with temperatures higher than that. Before you attempt to heat any electronic product, check that product’s labels or manual for a safe operating temperature. Switch it off and unplug it completely, and remove any batteries or ink cartridges. Use thermal probes to monitor the temperature of the heater and its contents. And know that there is always a risk involved with heat-treating electronics. Nuvan ProStrips are likely your best option. Nuvan ProStrips emit a vapor chemical called DDVP, which deeply penetrates through just about anything, making it very effective at treating difficult items. Simply remove the Nuvan strips from their sealed enclosure, place them inside their hanging holder, and bag the strips with your electronics in sealed garbage bags. Note that DDVP is not safe for people or pets, so you’ll want to handle the strips with gloves and leave the sealed bags alone for at least 48 hours. After the treatment, open the bags and give them time to air out outside, just to be safe. Always adhere to the product label and MSDS to ensure safe and effective usage. 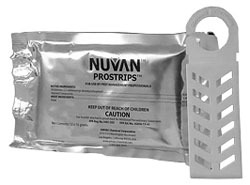 Treat electronics, shoes, handbags, clothing, toys sealed in an air tight bag with Nuvan ProStrips. Fortunately there is now a product that kills bed bug in difficult to treat items such as electronics. Nuvan Pro-Strips penetrate deep into items treated leaving no place for bed bugs to hide.